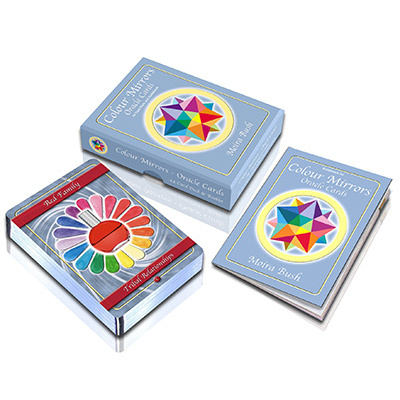 During a Colour Mirrors Conference in Slovenia in 2010, my good friend and mentor Moira Bush was inspired to create as set of oracle cards to help us make accessible to others what Colour Mirrors and colour therapy is all about. After the conference, Moira visited Venice with Melissie Jolly (the founder of Colour Mirrors system) to see the sights of Venice. While visiting St Marco’s Basilica, Melissie noticed an image placed in tiles on the floor of the main entrance. They instantly recognised the sacred symbol of the merkaba in various shades of blacks and browns. The merkaba in sacred geometry represents the shape of the energy field around the human body and is believed to be in exact proportion to Leonardo DaVinci’s Vitruvian Man (reference Drunvalo Melchezidek The Flower of Life). The merkaba image was adapted to represent the colours we find in our energy field and became the cover design for the cards. A few weeks after their trip to Venice, Melissie visited England, and she and Moira laid out 44 card size pieces of blank paper; they then placed on them the 18 Colour, 11 Angel, 9 Dragon and 6 Elemental bottles. This was an exciting process because the bottles already had their own names; what would they want to be called as oracle cards? Moira then connected to each bottle over the next few months and wrote down the wisdom and guidance they shared. The whole project took a year to complete with the longest process being the work Moira did with the graphic designer, who managed to combine photography, graphics and Melissie's artist friend, Hettie Saaiman's original artwork into the images you now see on the cards. To get the colours exactly right and proofed took many months of trial. The cards are intended to help you learn some of the meanings of the different colours, as well as to receive personal guidance and insights when you need it. To purchase Oracle Cards for yourself, visit my shop. There are several ways that you can conduct a colour card reading. Below are some examples that will help you get started. However, colour is one of the most intuitive connections you can make for guidance and insights, so always trust your own methods and feelings when working with the deck. Ask a Question: Shuffle the deck and bring to your mind a question or a person that you would like guidance on. Fan out the card and select the one you feel drawn to. You can do this with the deck face up or face down. Study the card and feel how the words impact on your question. For further insights go to the website and listen to the free meditation. Past/Present/Future: Shuffle the deck and draw 3 cards, the first card will represent insights into how the issue you are enquiring about impacted on your past and how it blocked you. This card also says that this is what you have learned and can now help others with. The second card shows how your situation is currently being experienced and the effect it is having on your reality. This is also the card that will guide you to the colour or bottle that could help you shift the issue and move on. The third card is the outcome once you let go of the block, what will it feel or look like to be free of the issue. Remember there are spiritual principles behind these cards, often the message of what needs to be cleared will be judgements, guilt, and an inability to love yourself or claim your personal power. Colour is a spiritual tool of empowerment. NEW - To help you gain the most out of your deck of cards, Moira has created a 1-Day course to help you delve deeper into the cards energy. You need no previous training in Colour Therapy to participate, anyone is welcome. The course will teach you over 10 different types of readings.